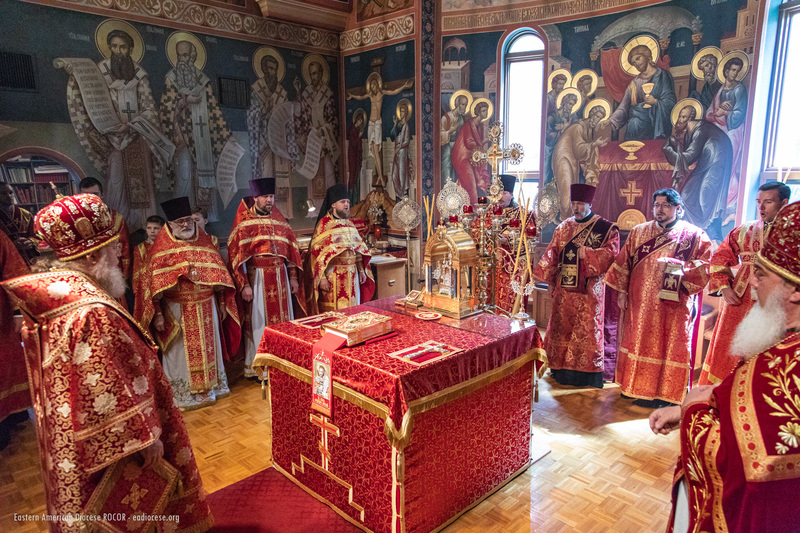 On Saturday the 23rd and Sunday the 24th of June, Metropolitan Hilarion of Eastern America & New York, rector of St. Alexander Nevsky Diocesan Cathedral, visited the Administrative Center of the Eastern American Diocese in Howell, NJ. On Saturday evening, His Eminence led the All-Night Vigil. 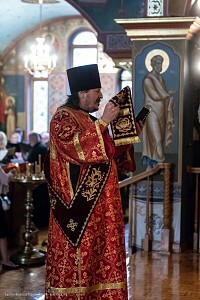 On Sunday morning, the First Hierarch of the Russian Church Abroad celebrated Divine Liturgy. 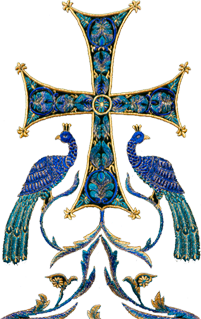 His Eminence was co-served by Archpriest Serge Lukianov (diocesan secretary and cathedral dean), Archpriest Zoran Radovic (rector of St. George Serbian Church in Elizabeth, NJ), Archpriest Rafael Melendez, Abbot Arseny (Manko), Archpriests Seraphim Chemodakov and Petro Hnatkivskyy (cathedral clerics), and Protodeacons Vadim Gan (cleric of the Synodal Cathedral of the Sign in New York City), Serge Arlievsky (cleric of Holy Dormition Convent "Novo-Diveevo" in Nanuet, NY), and Paul Drozdowski (cathedral cleric). 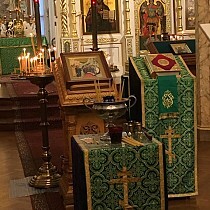 The services were sung by two choirs: a male choir of St. Alexander Nevsky Cathedral under the direction of mæstro Vladimir Gorbik, and a mixed choir under the direction of mæstro Peter Jermihov, sung by participants of the summer academy of the Patriarch Tikhon Russian-American Musical (PaTRAM) Institute held on June 21-24 at Princeton Theological Seminary. 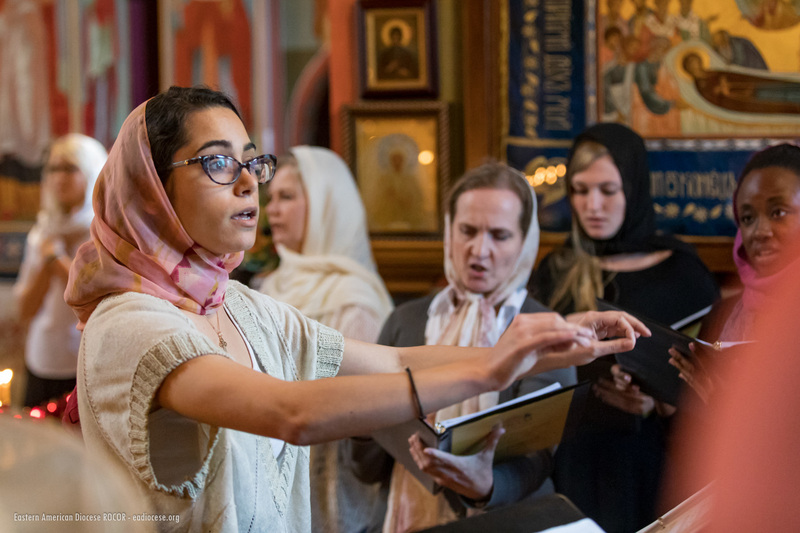 The Diocesan Center served as the culmination of the studies for church conductors and sings of various Orthodox jurisdictions in the United States. The cathedral was full for both divine services. Believers gathered to pray with their First Hierarch and to spiritually delight in the magnificent singing of both choirs. Many on this day received Christ’s Holy Gifts. At the conclusion of the services, the clergy and faithful processed to the gravesite of long-time cathedral rector Protopresbyter Valery Lukianov, where Metropolitan Hilarion served a litia. His Eminence greeted the clergy and parishioners, thanking the choristers who beautified the services with hymns composed by classical and contemporary composers. On the topic of the daily Gospel reading about the centurion and his servant, whom he cared for, His Eminence recalled the importance for the Orthodox of acquiring such qualities of compassion, love, strong faith, and humility. Cathedral dean Fr. Serge likewise expressed his gratitude to the singers for the radiant, jubilant atmosphere the choirs created, as well as the joy experienced by the faithful. A reception was held for the clergy, singers, and faithful in the two parish halls, where interaction between the clergy and parishioners continued.